Horseback riding instruction at Pony Gang Equestrian Services emphasizes balance, seat, and legs to communicate with the horse – no yanking the reins or kicking! 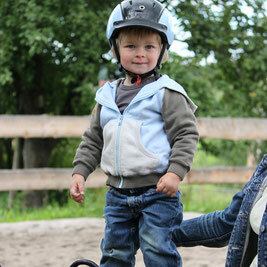 Balance is key to riding – it is a foundation on which our riding programs are based. We train riders to have proper leg and body position for a well-balanced seat. We do not rely on stirrups for balance. We teach correct leg signals to communicate with the horse. When a student has proper balance, he or she is then free to use various methods to signal the horse, while remaining safely in control. To build comfort level while on a horse, students perform a variety of balance exercise during each class. At Pony Gang Equestrian Services in Camden SC, lessons are comprehensive classes, involving constant reinforcement of fundamentals. Our Trainers provide immediate feedback and instruction. With a lifetime of riding experience, our Trainers know just how to explain the proper technique. Riding is more than just getting on a horse. Pony Gang Equestrian Services riding teaches all aspects of horsemanship including grooming, tacking up the care of a horse and even a little horse psychology. We provide Hunt Seat, Hunter over fences, Hunter Equitation, English, Jumper, Western Pleasure and Western Ranch riding lessons for riders at all levels of riding. So, don't wait any longer - Enroll in the Pony Gang Equestrian Services lessons program for horseback riding in Camden, SC today! Pony Gang Equestrian Services is a leading Camden, South Carolina horseback riding lessons instructor on NewHorse.com!